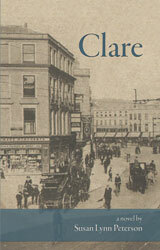 In honor of St. Patrick’s Day, “Clare” is on sale for $1.99 until March 20th. If you haven’t yet read my novel about a young girl’s immigration from Ireland to St. Paul, go on over to Smashwords and enter the code WR97D to pick up a copy for 60% off the cover price. If you have friends who like historical fiction or coming-of-age stories, please share.